Dave Rennick is a Sydney musician who needs no introduction. I remember seeing his indie rock band Dappled Cities back in the 2000's - It was always a sweaty good time on the dance floor. Rennick has been working on a new project called And* with two of Dappled Cities band members Alan Kumpulainen and Ned Cooke. 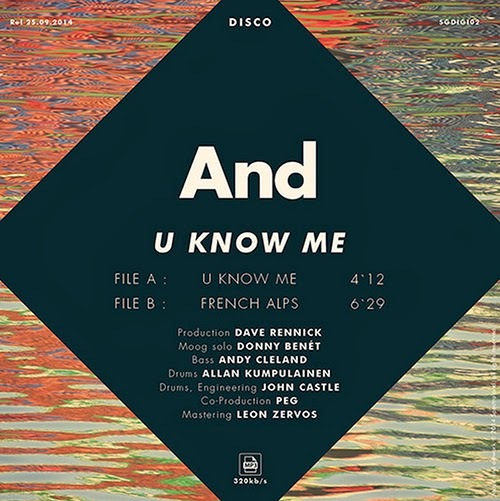 New single 'U Know Me' is disco funk at it's best. The ryhthm section is almost tribal and Donny Benét moog solo is spectacular! We hear the single is the first of five leading up to the And's debut album (due out some time next year).